These versatile game spinners make classroom activites much more fun and hands-on. Teach probability with them or simply use them with any laminated literacy or numeracy resource. You can even create your own spinner games. The Abacus Games Spinners are affordable so no one needs to miss out on the fun. The base and spinner can be detached and joined back together easily. This means you can reuse your game spinners for an unlimited number of activities, resources and games. And you’ll no longer have to spend time trying to build them from scratch. Each individual Spinner measures 70mm. "Great spinners for educational games." "These spinners were amazing for my literacy and numeracy resources! 100% buying them again and again. " "Before stumbling across this product I was left mcgyvering spinners out of pencils, split pins and paper clips. These spinners have saved so much time (and sanity) for me and my students. They were super affordable, allowing me to buy enough for each students in my class and are so easy to change between resources as needed. I love them!" "We use these spinners for different games all the time! An excellent product." "I am so happy with the game spinners. I think the colours are fantastic and the price is even better! Well worth it!" "It is really difficult to come across fab quality spinners for games so when I found these, I keep topping up my spinner supply because I use them for all the class resources! Love the flouro colours too!" "These game spinners make games within the classroom so much fun and a lot easier for students to use compared to a pencil and paperclip. Such lovely bright colours and for a great price! Changed the games in my classroom for the better! " "Thank you for creating a great resource to use within my classroom. The colours are great and vibrant and can be used across KLA's "
"These spinners are the perfect addition to any game to make it FUN and HANDS ON! The colours are just the best too "
"Love them! They fit and work perfectly!" "These spinners were a great investment. Affordable so I was able to buy enough for one per student in my class. They love using them with the various games I have made. Definitely a worth-while purchase!" 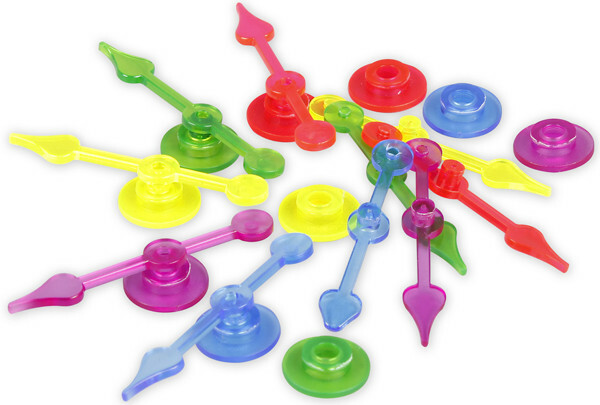 "The spinners are colourful and so easy to use. They have been amazing to use for game boards in my classroom. " "Perfect for laminated literacy and numeracy rotation activities and games. " "My kids love to use the spinners in our maths games. Thank you for the fast delivery as well! "